How are credit card payment fees calculated? 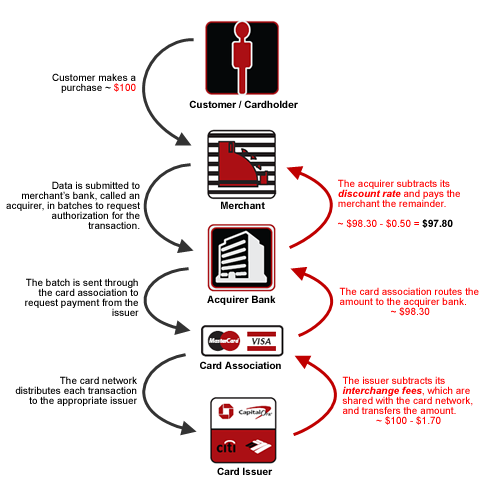 Now that we have an understanding of how credit card payments are processed, let's take a look at how the processing fees are calculated. Here are some of the basic terms or steps used; Authorization, Batching, Clearing and Funding. This is the first step. After the sales transaction is made an authorization is requested and it gets routed to the card-issuing bank. This step is where it lets the merchant know if a sale is authorized or denied. After a transaction is authorized it is then transmitted in batches to the acquirers bank or merchant account to receive payment. Next the batch is sent through to the card association where each transaction is routed to the appropriate issuing bank. The issuing bank will subtract an interchange fee (which is shared with the card association) and transfers the remaining amount back to the acquirer through the card association. The final step is when the acquirer release the funds to the merchant after subtracting its discount fee. The merchant is now paid for the transaction and the customer/cardholder will be billed by its issuing bank. The above is an example of how payment processing fees are calculated. Generally the interchange fee can range between 1 - 3% depending the on type of card used and the transaction amount. As for the discount fee, the percentage for this also varies and it can be influenced by numerous factors such as how the card is processed and the type of card. The range for discount fee ranges from 1% up to 5%. It is important to get comparison discount rates offered by the merchant account or acquiring bank as this rate is very competitive. If you are processing credit card payments today and are curious to find out how much you can save on processing fees we can provide a side-by-side savings analysis. Get a No Obligation Quote!